Longtime observers of the state’s electoral system say some North Carolina judicial districts might be unconstitutional, and ripe for legal challenges. Members of the Senate Select Committee on Judicial Reform and Redistricting expressed alarm at a Nov. 8 meeting. They may urge a fresh set of judicial districts at next year’s legislative session — the first major revamp in 60 years. Lawmakers also must account for a 2009 Wake County case suggesting the huge population differences among current judicial districts might violate several provisions in the state constitution. One problem could be requiring judges in certain judicial districts to live in specific areas. Superior Court judges elected in a handful of counties who preside over cases statewide state pose another concern. Sen. Dan Bishop, R-Mecklenburg, said Superior Court population and voting strength disparities in urban counties is alarming. Similar conditions exist in district courts across the state, he said, and previous legislatures have dealt with problems piecemeal. The state Supreme Court ruled in the 2009 Blankenship v. Bartlett case that the General Assembly violated the state constitution’s equal protection clause when drawing four Wake County Superior Court subdistricts. The court concluded the right to vote was not administered equally in “similarly situated” districts. The “gross disparity” of subdistrict populations resulted in huge imbalances in the ratio of residents to judges, the court said. Some judges needed fewer votes to get elected. Residents in some districts had voting power nearly five times greater than those living in others. Wake’s districts are the only in the state that divided into subdistricts with such a wide variation in voting strength. Senate Minority Leader Dan Blue, D-Wake, said reform is needed. Voting strength disparities in other counties have gotten worse since the Blankenship case, especially in large, urban areas. But he cautioned against rushing through changes without a deliberate, statewide approach. Urban districts have greater concentrations of minority voters, possibly triggering challenges under the federal Voting Rights Act. Blue advocated a review of smaller districts also as part of a comprehensive plan. Bishop reminded his colleagues that earlier this year a three-judge U.S. District Court panel in the Covington v. North Carolina case took lawmakers to task. Bishop said the panel admonished lawmakers about “the injury that is done to the rights of citizens by having elections conducted in unconstitutional districts,” and for failing to fix illegally drawn legislative districts quickly enough. “If a lawsuit was brought in Mecklenburg County, the court would grant summary judgment, the facts are so clear,” said Gerry Cohen, the state’s longtime legislative special counsel who retired last year. He drafted much of the legislation in 1987 that created the current Superior Court system. Mecklenburg’s Superior Court subdistrict voting strength disparity now is between 5:1 and 6:1, Cohen said. He didn’t know if disparities in other large, urban counties were that high. “The legislature could redraw the districts as was done under Blankenship in Wake County, or, I suppose, the court would do it if the legislature refused,” Cohen said. 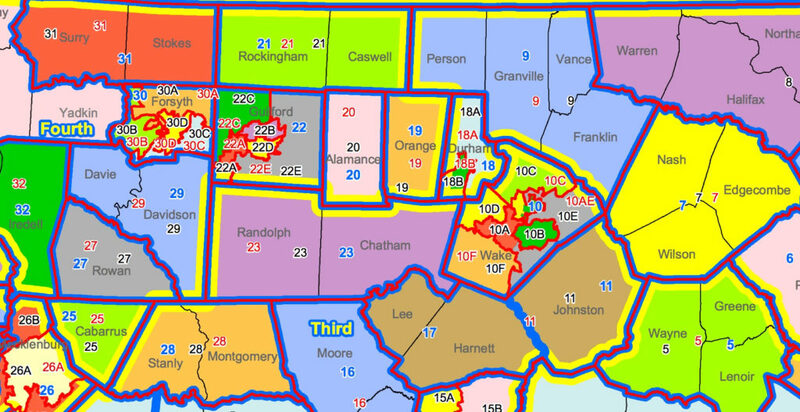 The three-judge panel in the Covington case appointed a special master to redraw some of the challenged legislative districts. Michael Crowell, a lawyer who worked at the UNC School of Government, was director of the Commission for the Future of Justice and the Courts in North Carolina that studied judicial reform in the 1990s. He thinks disparities exist in other county subdistricts that are worse than those challenged in Blankenship. Bishop asked Crowell if the districts were unconstitutional. “Until the court says so, no. But the precedent would seem to be there to make that a fairly easy case,” Crowell responded. Blankenship considered only subdistricts within a county. Crowell said that legal principle could apply between entire districts. “I mean, why shouldn’t it?” he asked, if voters in some judicial districts have three or four times the voting weight of residents in other districts. In Superior Court, for instances, judges serve statewide. Voters who don’t live in a Superior Court judge’s district cannot vote for the judge, but must abide by the judge’s rulings. Sen. Bill Rabon, R-Brunswick, asked Crowell if it is constitutional for a set of local voters to elect a Superior Court judge with authority over all state residents. Crowell said it could, as the state constitution says voters have a right to vote in any election for political officers who affect them directly. Both Crowell and Cohen raised concerns if the legislature drew new so-called residency districts. Some multicounty District Court districts reserve seats to judges who reside in a specific county. The lawyers noted the Supreme Court has repeatedly ruled that the state constitution bars adding any new qualifications to elections. Placing residency requirements for a new district could be considered a new qualification. Cohen and Crowell warned against double-bunking more black judges than white ones when redistricting, saying it could trigger a Voting Rights Act lawsuit. Lawmakers also should avoid a partisan gerrymander, they said.